Your opportunity to win an Amazon Echo Dot has arrived and it’s as simple as like and comment for your chance to win. Every new like or comment of our Facebook page or our competition post, will enter you into the prize draw. Make it fun and comment on our post and tell us how you will use your new Amazon Echo Dot or your special Malta Moments. The competition will end on the 31st January 2019 and no new likes, comments and shares will be added to the prize draw after this date. 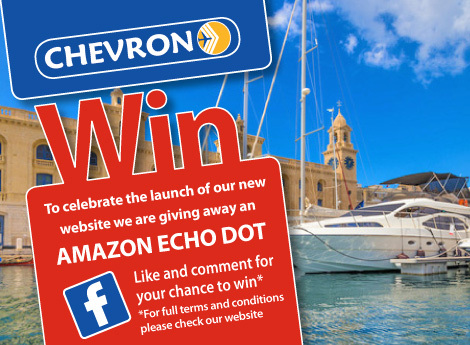 We will announce the winner, on the Chevron Facebook page, by the 4th February 2019. Any entries after the 31st January 2019 will not be considered. Each contestant can only be entered into the draw a maximum of 3 times. Entries into the competition must supply correct information to be eligible for the prize; dubious entries will be removed from the draw. You must be 18 or over to enter. Competition is not open to Chevron employees or immediate family members. Prize has no monetary value and no exchanges can be made. Chevron reserves the right to cancel or change the competition at any time. Once the winner has been announced, they must claim their prize within 14 days from the winner announcement or they will forfeit the prize. The winner will be annouced on our Facebook page; to claim the prize, message us on Facebook or send us an email with your postal address. If the prize is not claimed, Chevron reserves the right to then offer the prize in another competition. This competition is run solely by Chevron and has no affiliation with any other parties.